Although this Cuisinart Toaster Oven is a bit on the expensive side, from my stand point at least, it is so convenient and such a joy to use. I did quite a bit of research from reading consumer reviews on many different websites that sold this to find the best overall value in a Toaster Oven and decided on this model. It heats up quickly and the clean up is very easy. It also saves a lot of counter space because it's not as big as the old school toaster ovens. This is almost like a compact oven rather than a toaster oven. There is a little hum from the convection oven, but not loud enough to be bothersome or annoying. Even Heating For the most part I have had no problems, it just takes a little getting used to and adjusting in temperatures to figure out what's right for you and the way you want your food prepared. Safety It's small enough to be discreet in the corner of my counter top so my kids don't bother with it. That's the only safety I'm really worried about. Ease of Cleaning It's fairly simple to get in there and clean. I am pretty sure the walls are non stick, which is a huge help in the cleaning process. Durability I haven't thrown it around or anything, but I would say it's durable. I push it back in to the corner on my counter top pretty hard at times, and it has never affected it. Design It's very stylish and modern. I bought this Cuisinart CTO-390PC Toaster just recently for the purpose of saving electricity. I usually use this whenever we only have little amount of food to re-heat or broil. We already have double oven and microwave oven to do the the same job however it seemingly a waste for electricity when I use these two machines for a small amount of food. My decision of buying this Cuisinart CTO-390PC Toaster is never a regret. True enough, since I used this, I am able to save electricity and so I also save money. Sometimes, I also use this machine for baking small amount of pizza. This toaster is even much recommended to those who are living alone or to new couples since they only need little amount of food to bake, toast, broil, re-heat so they don't need to use big oven. This toaster too comes in a beautiful design. It is easy to clean. Since it is not too large, you won't be worried of the space where to place it. This is quite a nifty device here. I use it for toast, heating up sandwiches to melt the cheese and warm the meat, warm up cold pizza, and lots of other uses to. It takes more time than a microwave obviously. But takes less time than a regular oven. I would recommend this though. It's pretty handy. At first i wasnt sure how i would use the toaster oven (i never had one before) But once i got the hang of it (it was pretty simple) I started using the toaster oven for everything I could. It beat out the microwave. And my food tastes soo good when im done. Even Heating It heats up quickly. Ease of Cleaning Cleaning it is pretty simple except for the crumbs that get in the backs and the corners then you have to dump it out and clean it carefully. Durability I have used it for many things, toast, french toast, poptarts, Pizza crusts and so much more and they dont come out burnt. It lasts. I originally bought the white Cuisinart toaster oven with convection, and it worked great, but I sold it because it quickly discolored around the door from its own heat. I replaced it with the stainless steel Cuisinart Convection Oven, which I absolutely love for its size, capacity, functionality, and ease of use. It's perfect for baking, roasting, or broiling everything from meatloaf to french fries to pies and smaller pizzas. When I moved to a new city and left most of my appliances and furniture behind (temporarily), this toaster oven is the ONE appliance I really missed, especially during summer when I wanted to bake or broil but didn't want to heat up my kitchen with the large range. It also helps to keep electricity costs down. The oven heats up quickly and beeps to let you know when the desired heat is reached. The controls are intuitive, and the oven heats evenly, so cookies, cakes, and pies will be perfectly browned. The extra-large capacity isn't reflected in the footprint of the oven; it doesn't seem oversized but just right. You can easily fit an entire Totino's sized pizza in it. I use the broil feature often for things like open-faced sandwiches, homemade fries, and grilled hot dogs. I use the convection feature for baked potatoes to speed up their cooking time. I haven't experimented much with using convection for other baked goods, but I was willing to pay extra for it, and I plan to use it more. The oven has a clock feature that is always on, unless you unplug the oven, so if you're really into saving electricity, be sure to unplug it. This is a toaster oven that will cost you more than the basic, cheap one, but it's so valuable for any kitchen. Even Heating Items toward the back tend to cook more quickly. Safety The top and sides get very warm to the touch. Love my Cuisinart Convection Oven!! My husband and I bought several Cuisinart kitchen appliances after we got married. This convection oven is one of my favorites. It is a little big, however that actually is one of the great things about it since it can fit all sorts of things. We probably use it most to reheat meals, and for cooking pizzas(it can fit an entire pizza), but it really can do anything. What even makes it better is that we can use this instead of our oven so we don't heat up our house in the summer. I have even used it to make a few cookies when somebody has a craving. It cooks evenly, quickly, and looks nice on our counter. I have had several toaster ovens in the past, and would never consider buying another one again. We have had this for over 5 years, and hopefully it will last a lot longer, but I will buy another one when it is time! For 2011 my new year's resolution was to stop using our microwave. To replace it we decided to buy a convection oven and found this cuisinart convection oven at Costco. So far we have found it to be incredible useful and very effiecient in reheating leftovers and baking. It uses less energy and cooks faster than our oven. I found the capacity to be much larger than simialr models, large enough to fit a 12" pizza ont he racks. It comes with one rack and three levels depending on what you are cooking. THere is a baking dish and another rack that is great for french fries and baking cookies. You can also toast although I find it easier to toast bread and bagels in our regular toaster. It is all digital which is very helpful and I think more accurate than the twist timer varieties. There is a built it timer on it that you can use as well. The only drawback is that it does get very hot. We have ours set out where there is nothing on either side closer than 6 or 8 inches and nothing above it. How did I live without my Cuisinart Convection Toaster Oven??? The Cuisinart Convection Oven / Toaster / Broiler is AMAZING. We have a big family and use this toaster over several times throughout each day. The options are endless; we toast bread, make full-sized cheesecakes, casseroles, pizzas, sandwiches, lasagna, etc. It is so easy to use even the men in the house know how to work it! I would recommend this to anyone looking for a toaster oven that will do everything. It's really great if you have small items to bake and don't want to heat up your kitchen with the oven. This toaster oven heats up pretty quickly, too. The only downside to it is that it gets really hot on the outside, so do not leave anything sitting on top that could get damaged or could melt. I was looking to streamline my kitchen by purchasing a few two in one products to save space. I saw this broiler/Toaster oven combo and decided to purchase it. I like several features on it. First, it is able to cook a pizza. This is great in the summer, so that my kitchen doesn't get so hot when I turn on the oven. Second, it is a big space saver. I can keep it on the counter and it looks great sitting there. The one con is that it can get very hot on the outside. This isn't a problem if you are aware of it and take proper precautions. Other than that, this is a great machine. It does what it says it will do. Toast...broil...you name it, it will do it. I would highly recommend this toaster oven/broiler. I have done a lot of research before I sprang out the money for this convection oven/ brioler. My old oven still worked but was very weak and just looked like it needed to be replaced. I use this oven from toasting bread to broiling chickens for dinner. 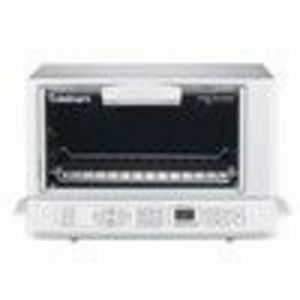 This convection oven is very versatile and does everything you want it to do. One thing that caugh my eye was the nice slick look of the stainless steel. This fits my kitchen well because my fridge is also stainless steel. I also love that the buttons to operate it is electronic. I am a tech geek and love to play around with the features. This oven is bigger then most and is a little bit more complicated to operate but it workes extremely well. I haven't had this for too long but it has worked great since day one. I hope to have this for many years.